I am not sure exactly where this relief was located of what it is of. Our notes record it as “A mascaranas. Pregnant Man. King Smokey Mirror”. Sadly, I have not been able to come close to finding out more. We saw it between the Tamazcalli and the Lost World Pyramid (5C-54), but I have no more information than that. The relief looks to be of a skeletal being who is sat cross legged. 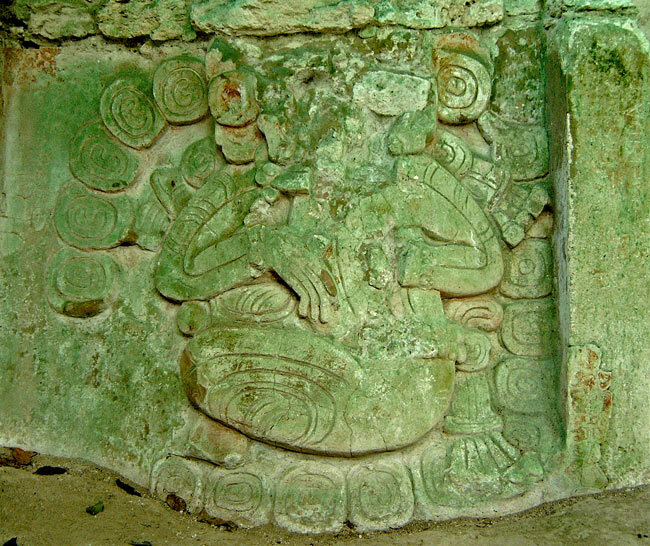 There are a lot of “C” motifs on the left and “O” motifs on the right and below, which to my limited understanding relates to Chac, the God of Rain.